The crypto market has entered into a bloodbath today, with coinmarketcap.com showing just two cryptos in the green for the past 24 hours as I write this (you can click once on the "Change (24h)" column to quickly sort the list from greatest increase to greatest decrease). Naturally this has the usual cast of characters coming out of the woodwork to pronounce Bitcoin "dead." 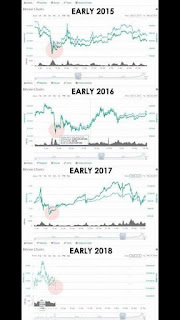 You may need to zoom in on the chart a bit, but the part to focus on is on the left-hand side of each yearly graph where there's a red circle highlight. 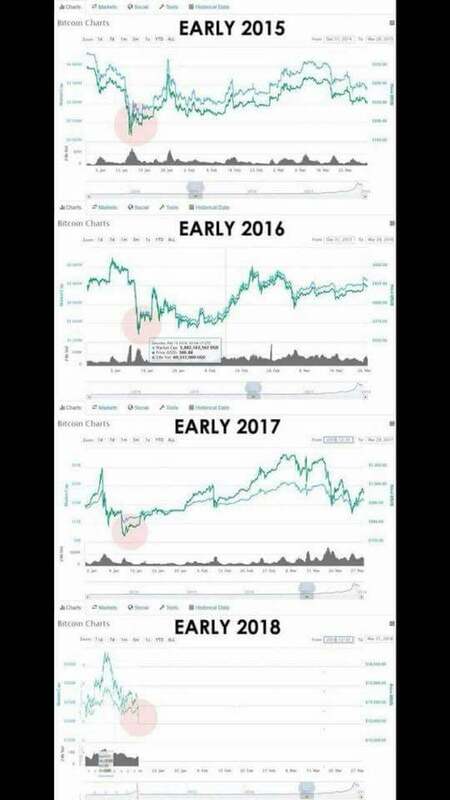 As you can see looking from year to year, this is a repeating pattern. There could be several explanations for this, but since Bitcoin is a global commodity it's difficult to pin down just one cause. Here in the U.S. at least this could be explained by our tax laws as they pertain to capital gains on property: at the end of a calendar year, one could sell losing positions to have a deduction against other gains. Another possibility: after the new year begins, it's possible to face zero tax liability on gains if one's income from wages and ordinary interest will be below a certain threshold by the end of the year. Whatever it is that motivates people to act at this time, the short version is, "we've seen this before." 2) Get into something like Hashflare, which I've just begun building up myself. I purchased 460 gigahash worth of contracts yesterday for about $100 USD, and have already received my first payout. Even at these seasonally depressed BTC prices (underscored by today's massive decline), my contracts are showing a profit forecast of 213%, roughly. This will get better on its own as the price of BTC recovers, of course, but I'm making it better than that: Hashflare accounts have an automatic reinvestment option that will purchase additional hashing power for your account each time you have enough Bitcoin to afford another one. At current BTC prices, my $100 of contracts will add an additional contract roughly every five days, which will of course contribute to the revenue stream, speed up the process, and also feature an increasing profit forecast as the price recovers (likely an even better forecast than my original lot since these new contracts will have been purchased at a lower BTC price).